Knifehog’s Addison reviews the Gerber Winchester. See what she has to say about this classic bowie knife. Hey guys, welcome back to KnifeHog.com! Addison here and today I’ll be reviewing the Gerber Winchester Bowie. The Winchester has an overall length of 14 ¼”, a blade length of 8 ¾” and weighs 9 ounces. The blade is constructed of surgical stainless steel and features a plain, flat grind with a clip point tip. The handle is composed of polished, wood-grain material that is held together by twin brass rivets and features a brass finger guard. This knife has a full tang construction and comes with a ballistic nylon sheath that features a belt loop and two snap closures. Overall, the Gerber Winchester is a decent hunting knife. Its intimidating size, full tang construction and durable sheath make this knife a reliable companion to take on a hunting or camping trip. The razor sharp edge and large size of the blade allows you to cut through a variety of tough materials, such as thick cloth, thin wood and rope. The blade of this knife is also sharp and durable enough to process small game! Although the handle is a bit smooth, the evenly spaced finger grooves provide your hand with a comfortable and durable grip. Personally, I think this knife is pretty solid but it is really not designed for strenuous cutting tasks. The surgical steel this blade is constructed of is not sturdy enough to cut through certain materials and could very well snap or the tip may break during any heavy duty cutting activity. Also, the blade is much heavier than the handle, which makes the knife as a whole completely unbalanced. Honestly, this knife is a decent hunting companion that can cut through light and fairly tough materials but I think it works better as more of a “showpiece”. With this in mind, I give the Winchester 3 out of 5 stars. Did you like our review? Then make sure to share this video. 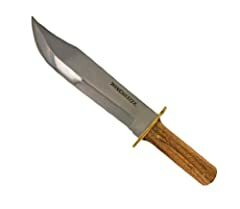 Buy the Classic Gerber Winchester now at KnifeHog.com. It will snap in two at the hilt with continued heavy use. Do you guys actually test any of the knives you review? And really, even a novice knife user can tell this is not full tang. Come on guys. This knife does not have a true full tang construction. It will break on u in know time. One of the worst out there. Addison makes that sheath look good! Do you even test your knifes or is this just your educated guess ?? 0:41 honey, that’s not a Full Tang. why is a woman reviewing this? gender aside, she doesn’t even look like an outdoors type, she looks like a secretary or commercial girl… get a woman’s job or get more outdoorsy. She is right about it being a Show Piece,,,but incorrect about that Tang. There are a few $20 Bowie knives that are full tang and are pretty darn tough (some of the Mossy Oak Bowie’s, Uncle Henry’s and a few others) …. this Bowie’s NOT one of them. If you can’t see the full tang going through the handle to the end (doesn’t matter the material the handle is made out of, don’t buy it !!). This knife is NOT a full tang. I have a full tang Walmart wood Bowie and it is pretty good, it has taken a beating (Mossy Oak branded, full tang). For the money as a user tool that you don’t care about, the full tang version it is a great Bowie —– it just might surprise you ! This knife does NOT have a full tang. It ends about a quarter of an inch below the second rivet. If your definition of “rat tail” is a tang both shorter and narrower than it’s handle, then this is a rat tail. That said, it’s pretty solid as rat tails go. Considering the low price I don’t have any buyer’s remorse. It’s an adequate backup hunting knife which I would never consider using as a camping or bushcraft tool. sweet, but glad I didn’t buy it due to not full tang. For a person that spends more time painting her nails she does knife reviews and gets a lot of information wrong about the knife, such as the tang. I have had this blade for many years. yes it is only for show. the bras pins have moved out some and are not flush with the handel. this is the one blade in my collection that people complain about the most. but the blade itself looks cool. it also looks very intimidating. but for hard use a $20 Mtech blade would bo better. or a cold steel GI tonto. I have really pounded on mine an it still fine, also $20. usable blade = mabe but not my first choice. there is a small blade called a hulta force. $10-$15 similar to a Mora but no scandy grind. this is the perfect woods blade. plus a GI Tonto. you get a large blade and a medium/small blade combo. I have both blades in my trunk of my car.